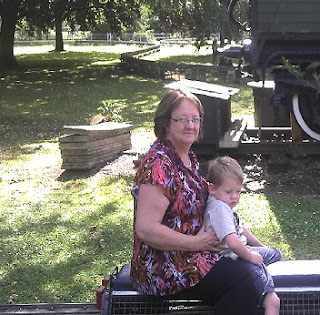 The greatest thing about Tonbridge Park is the trains that you can ride each Summer on the weekends. This is just one of the many attractions available in Tonbridge. The park runs behind the high street from the Castle almost to the Station. My son doesn't look especially happy to be riding the train, but believe me he loves it and just doesn't like having his photograph taken at the moment (he might tomorrow!). Just next to the train line is the swimming pool. I haven't been to the Tonbridge swimming pool in many years, but I do love the outdoor pool. One Summer I purchased a seaon ticket for the pool for a really good price and made great use of the outside pool, steam room and jacuzzi. The best thing about the outside pool is that no one uses it if it's raining and you get it all to yourself. 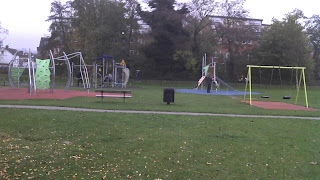 There are many other activities going on in and around Tonbridge Park. Judd Rugby Club shares the car park by the swimming pool, and many football games and Cricket matches can be played on the playing fields which are pretty huge. 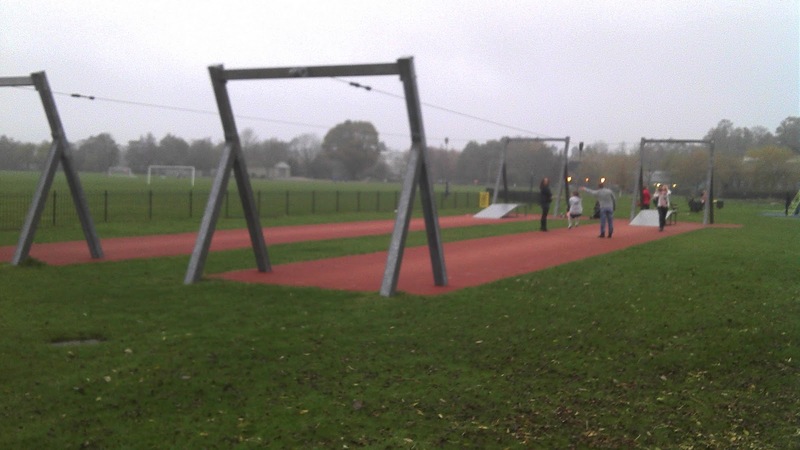 There are also tennis courts, a basket ball court and skate ramps for the older kids. 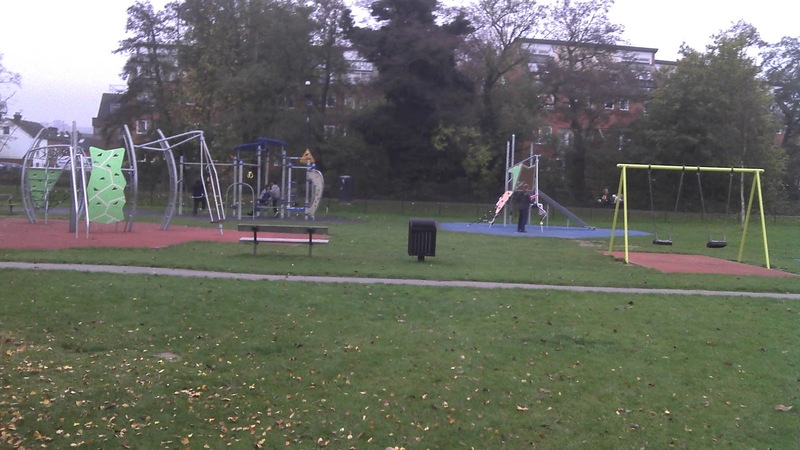 New exercise equipment has also been installed in the same area for those that want to go to the park to use a step machine. 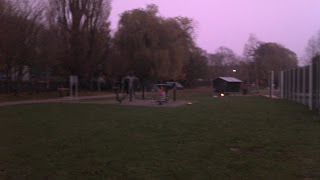 Awful photo I know, but remember I did say it was dark and damp. This is the exercise equipment area with the basket ball courts to the right and skate park in the background. Again as happened at HollyBush Playground last week, William fell asleep on the way to the park and woke up grumpy. He walked straight past the crazy golf course on the way to the swings (when I say walked I mean he was being carried by my husband who was walking, grumpy kids don't walk). The snack stand was closed so late in the year and day. In the Summer they often have a bouncy castle which you can pay to play on. 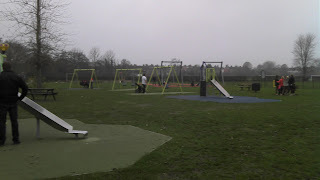 The main kids play area meets my criteria of being fenced in, and Tonbridge park had the forsight to add sand to the mix which William loves. This sand pulley is a nice touch, but they failed to realise that kids don't like to share and there is only one sand bucket to play with. 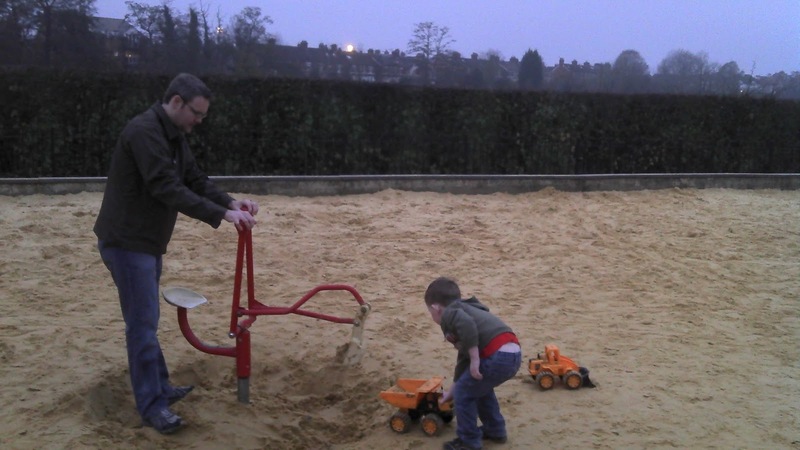 Go to Godstone Farm and you'll find out how you should do sand. We actually got William to participate by letting him play with his shoes on (bribery). The trucks had been left there. 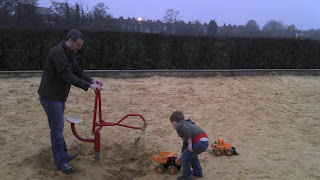 The red digger my husband is modelling is sadly too difficult for my son to work (again Godstone did a better job). My son loves to dig for hours in the sand, watch out anyone who brought a spade with them, he loves to share other peoples belongings. There are areas for larger kids and smaller kids. 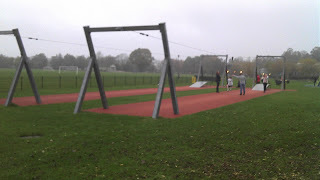 I think Tonbridge did a really good job at providing a large choice of play equipment. You could stay here all day, bring a picnic, play some ball, get some exercise etc. I'd really like to see something like this in Sevenoaks. The bigger kids area with the complicated climbing equipment. My Husband and Son, couldn't keep still for the phone camera that doesn't do movement. These swings can be used by less able bodied individuals (adults or kids) with the use of harnesses which are kept in the box in the background. Every kid will love Tonbridge Park because there is so much to do. 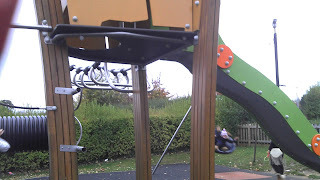 The play equipment will never get boring because there is just so much of it, and if you do take a picnic, you can feed the leftover sandwhiches to the ducks swimming past in the Medway. There are toilet facilities which I have always been too scared to use after my encounter with Kemsing public toilets while 8 months pregnant (you need seats people!!). 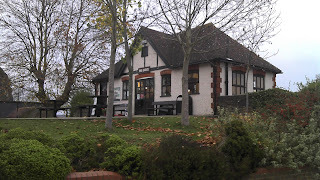 If you want to find out more about what's going on in the Sevenoaks for kids check out my website. I will warn you to take your wellies to the park if the flood barrier is open. As you pull into the car park at HollyBush recreation grounds you will see The Lodge Coffee Shop, a great place to grab a coffee after a workout with Fitmums (postnatal exercise with your baby) or to keep warm when you have to get out of the house in the Winter months. To the left is an all weather astro-turf pitch which I have played hockey on many many years ago (primary school). Past the coffee shop are the tennis courts, and to the right you have the local indoor and outdoor bowls clubs. My Dad plays for the indoor club, you may see him mentioned occasionally in the local newspaper (The Chronicle), they play in lots of tournaments all over Kent. Actually, they are looking for players so why not check it out, they need some new blood. If you walk around the coffee shop you will come to the main attraction (for the kids at least), a small but beautiful playground surrounded on all four sides with a gated fence (an absolute must for my 3 year old). It was a cold day that I took these photos, and William was not excited at all about playing. 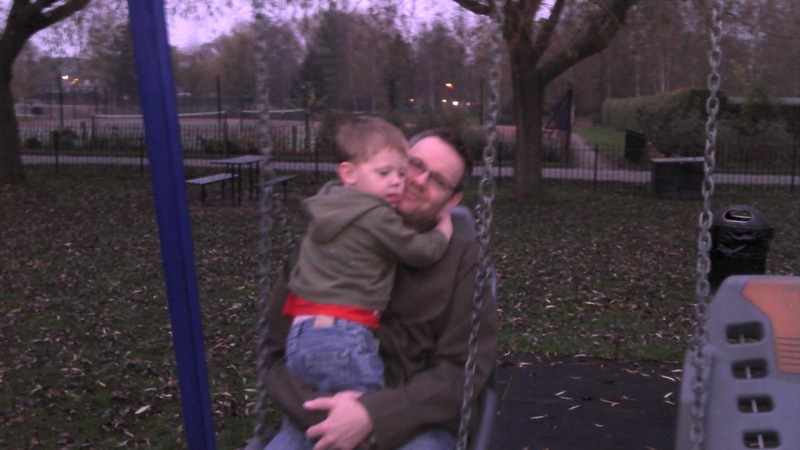 We whisked him up to HollyBush on a cold weekend afternoon to make sure he could use up enough energy to get him to bed early but he fell asleep in the car and was very grumpy when we got there. 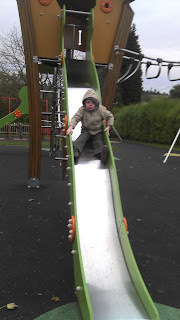 We walked over to the bowls club to see Grandad play and show off the baby to all the other players, and then practically had to drag William over to the playground. He wanted to be back in the warm at home watching the Chipmunk movie. Did I also mention that the Bowls Club has a new cook, and meals are available if you want something more than the Lodge has to offer for lunch. 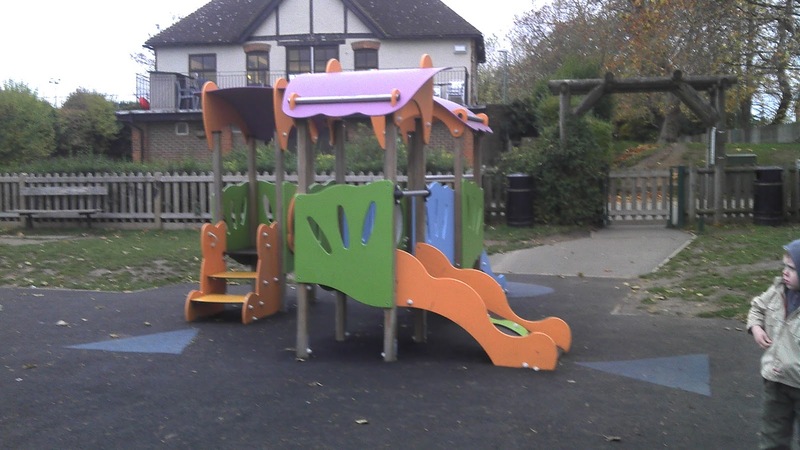 There is play equipment available for the older and younger kids. The play equipment shown above is a little small for William now, but great for those that have just started to walk. 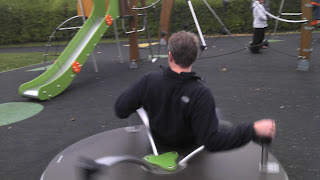 There are also baby swings and one of the ones that is a big concave circle that babies can lie on to swing (if you wait for the teenagers to get off that is). 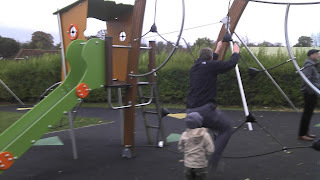 For the bigger kids there are swings, a zip line and this climbing structure. 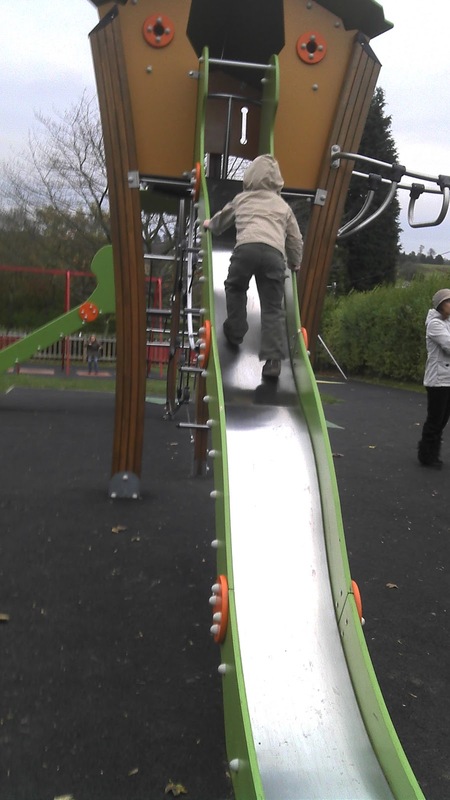 Some of the climbing is actually quite hard as my husband is demonstrating (William is still refusing to participate), this is the medium sized slide. 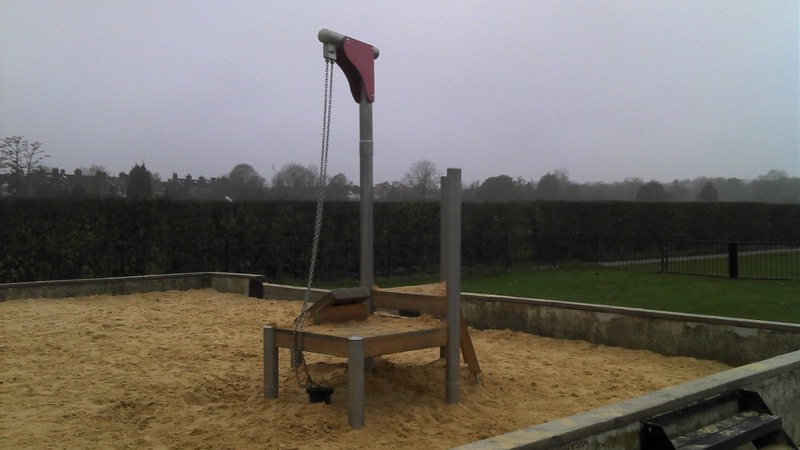 I do wonder sometimes who decides what is placed in each playground and whether anyone actually tests them out before they are built. 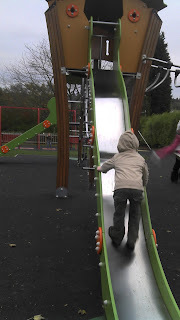 There must be some superstar playground testers out there that could win gold at the olympics if they can get onto this slide easily. William was so grumpy that he wouldn't even play on his favourite roundabout. 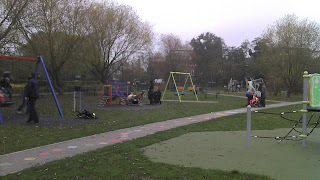 I've never seen this playground empty, and in the Summer the area just buzzes with the kids and parents drinking coffee. 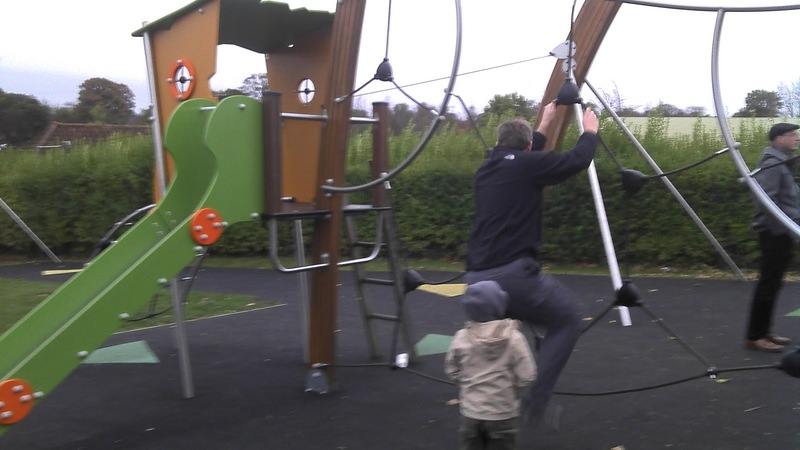 Most weekday mornings there are more than one exercise class going on in the play field, and it's just minutes from the centre of Sevenoaks. It's an oldie but a goodie, I used to play there as a kid and now bring my two to play (I'm so glad they improved upon the equipment I used to play on in the 80's). For more information about my family or the local resources in Sevenoaks click here.